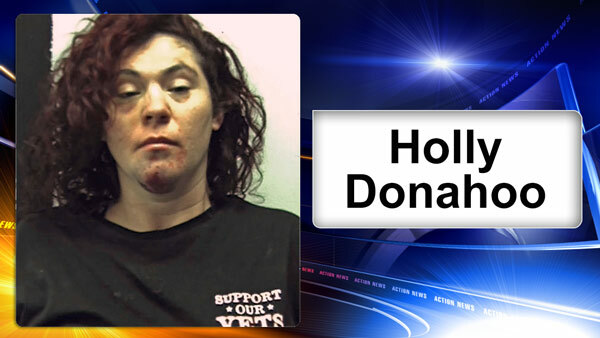 CHALKHILL, Pa. -- Authorities say a drunk driving suspect who was chased by police from Maryland into Pennsylvania identified herself as Hillary Clinton. Pennsylvania State Trooper Robert Politowski says the woman he arrested early Tuesday is actually 36-year-old Holly Lynn Donahoo, of Louisville, Kentucky. She was being chased by sheriff's deputies from Garrett County, Maryland, and Maryland State Police when she drove into Wharton Township, in Pennsylvania's Fayette County. Politowski joined the chase and used spike strips to flatten Donahoo's tires. She was taken to a hospital, where police say she refused drugs and alcohol testing. She has been jailed on charges including driving under the influence and fleeing or eluding police. Donahoo doesn't have an attorney. Her preliminary hearing is set for May 9. It's unclear why she identified herself as Hillary Clinton.